Depiction of Aloe, labeled in Greek "ΑΛΟΗ" (Aloë) from the Juliana Anicia Codex, a copy, written in Constantinople in 515 AD, of Dioscorides' 1st century AD work. ^ a b "Aloe Vera: Science and Safety". NIH National Center for Complementary and Integrative Health. April 2012. Retrieved 31 March 2013. ^ Manning, John; Boatwright, James S.; Daru, Barnabas H.; Maurin, Olivier & Bank, Michelle van der (2014). 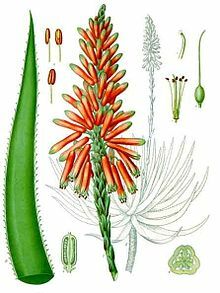 "A Molecular Phylogeny and Generic Classification of Asphodelaceae Subfamily Alooideae: A Final Resolution of the Prickly Issue of Polyphyly in the Alooids?". Systematic Botany. 39 (1): 55–74. doi:10.1600/036364414X678044. ^ "RHS Plantfinder - Aloe 'Lizard Lips'". Royal Horticultural Society. 2012. Retrieved 5 January 2018. 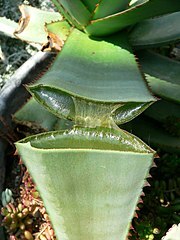 ^ "Aloe". Cancer Research UK. Retrieved 30 August 2013. ^ "Status of certain additional over-the-counter drug category II and III active ingredients. Final rule". Fed Regist. Food and Drug Administration, HHS. 67 (90): 31125–7. 2002. PMID 12001972. Carter, Susan (2011). Aloes : the definitive guide. British Cactus and Succulent Society. Richmond, Surrey, UK: Kew Pub. ISBN 9781842464397. OCLC 670480354. Ben-Erik, Van Wyk; Smith, Gideon. 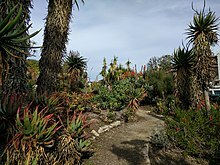 Guide to the aloes of South Africa (Third ed.). Pretoria, South Africa. ISBN 9781920217389. OCLC 897036340.